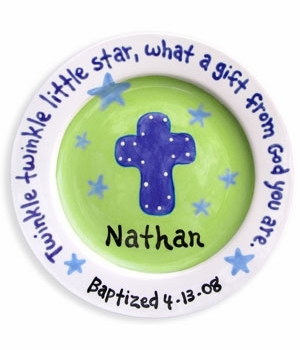 This personalized blue/green cross plate makes a great gift for baptisms and christenings. The hand painted plate features a cross on a green background with blue stars. 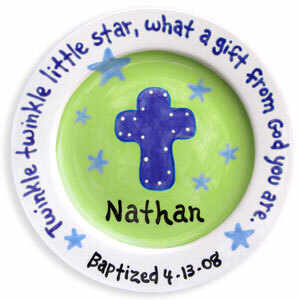 The plate's border features the sweet rhyme "Twinkle Twinkle little star what a gift from God you are ". It can be personalized with baby's name and birthdate. For an extra special touch, add a personal message to the back of each plate (eight words maximum). All plates are dinnerware and dishwasher safe. They are hand painted by Kathleen Virtue and made in the USA. This item is custom made upon order and ships directly from the designer. Please allow time for personalization and shipping.